In the Chocolate Body Scrub you will find Organic Cacao Nibs, Organic Coconut Oil, Organic Cacao Butter, Organic Chia Butter, Organic Brown Sugar, Organic Jojoba Oil, Organic Honeycomb, Organic Vitamins E, Organic Sweet Almond Oil. This was the most challenging scrub for me to use. My guilty pleasure is (dark) chocolate as it is for most of us. This scrub smells exactly like chocolate pudding. Hence, it was almost impossible not eat it. Personally, this scrub smelled way too edible for me to use regularly. Therefore, it is not my favorite. In the Coffee Body Scrub you will find Organic Coffee beans, Organic Coconut Oil, Dead Sea Mineral Salt, Organic Tea Tree Oil, Organic Brown Sugar, Organic Jojoba Oil, Organic Grape Seed Oil, Organic Shia Butter, Organic Honeycomb, Organic Vitamin E.
This scrub smells phenomenal. That's if you think freshly brewed coffee is phenomenal (which I do). The scent is very pungent in the most amazing way. If you have been following me for awhile then you know coffee scrubs are my absolute favorite. 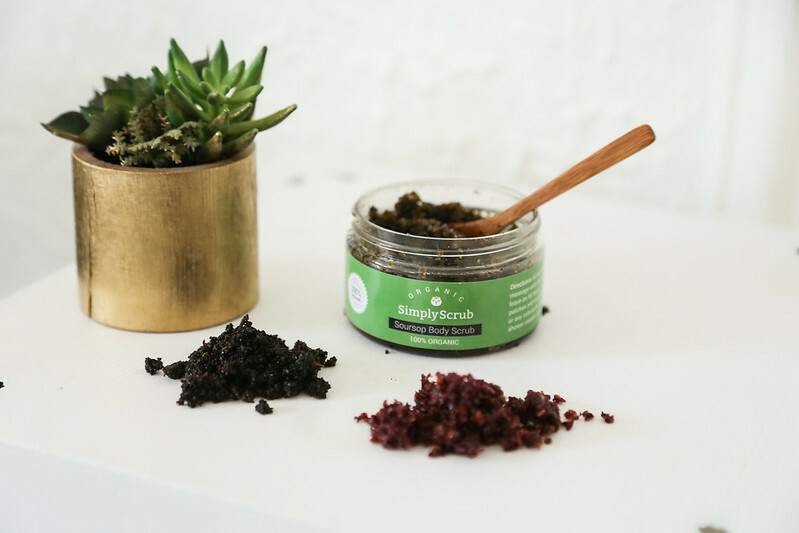 This scrub is a little more rugged than the rest which is perfect for elbows, knees and feet. Also great for extra dry areas that need to be exfoliated. In the Rose Body Scrub you will find Organic Rose Buds Petals, Organic Avocado Oil, Organic Sweet Almond Oil, Organic Shea Butter, Organic Brown Sugar, Organic Jojoba Oil, Organic Tea Tree Oil, Organic Coconut Oil, Organic Vitamin E.
I love the smooth texture and how it goes on your skin really easily. I believe because of the petals it's a lot silkier on the skin then the other scrubs. My first reaction to opening the bag was that it smelled a little itsy-bitsy funky. Not a funky that I can't handle but more like an unexpected actual rose smell. For those of you who know the real smell of rose this is exactly what you're getting. A lot of people aren't familiar with organic products and it might throw you off when you smell raw ingredients. That is why I wanted to mention the fact that these are 100% organic natural products and they might not smell like what you expect them to... real. Despite the surprising scent, I absolutely loved how nice my skin felt after using this scrub. Moving on to my utter favorite.. In the Soursop Body Scrub you will find Organic Soursop Leaves, Organic Coconut Oil, Dead Sea Mineral Salt, Organic Tea Tree Oil, Organic Brown Sugar, Organic Jojoba Oil, Organic Vitamins E, Organic Green Tea, Organic Shia butter, Organic Mint Leaves, Organic Grape Seed Oil. I love herbal tea and this scrub screams exactly that. When I used it in the shower I felt like a bag of mint tea steeping in warm water just waiting to be served. Ahhh! I passionately love this one. Theres a level of freshness that I cannot fully explain in this scrub. It's very earthy, yet clean. All the scrubs leave your skin feeling really nice even after towel drying. Almost like baby moisturized skin. "NYTRENDYMOMS" until the end of July.